Moving With Your Dog | Moving With Dogs | Tips For A Low Stress Move With Pets! Follow A Plan To Cut The Stress! Moving with your dog, or other types of travel with dogs, can be an unsettling experience for pets, but there are ways to make the move go more calmly and reduce the amount of stress on your pet, if you plan ahead. Moving dogs means thinking about the upcoming move from their perspective. Assuming you know far ahead of time about your move, start preparing early even if you don't really have to. It will be easier on Rover if he gradually gets used to seeing the packing of boxes and other typical moving activities. Leaving all the frenzy to the last minute, would understandably be confusing and stressful to your dog. Just imagine what it would feel like if you woke up one day without any warning, to see all your stuff being shunted out the front door into a truck! Several weeks before your move, consider what will make your dog more comfortable during the travel to your new home. 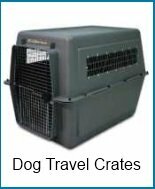 If you don't have a travel dog crate, now would be a good time to get one, along with seat belts designed for a dog's safety while riding as a passenger. Leave the crate out so that Rover has a lot of time to investigate and enjoy his new den. Put a toy and a piece of your clothing inside for encouragement. If he already has a crate and likes it, so much the better. This will be one place of security for him during the journey or when you stay overnight in hotels. Other times he can just ride along wearing his seat belt with the option of sitting up or lying down. If your dog has not had much experience traveling by car, take him on a few longish rides to see how well he handles road travel. Most dogs seem to enjoy car rides as long as the windows are down a tad to give them a whiff at all the interesting aromas. But, if it's not a positive experience, talk to your vet for advice. Plan ahead for pet friendly accomodations if you'll be making overnight stops during your journey. For extra help take a look at our "https://www.dog-spoiling-made-easy.com/pet-travel-checklist.html">pet travel checklist. Moving With Your Dog - Name-tag That Doggie! Losing your dog during the move would be your worst nightmare. So, make sure your dog is wearing some form of foolproof identification containing all your new contact information. You might want to consider registering with one of the pet finder companies as an extra precaution. Before you move, take some pictures of your dog to have available just in case he gets lost. Be especially attentive to your dog on the road to look for any signs of distress and especially when you make stops to give everyone a break. And, be sure he is safely in your control to prevent any nervous attempts to run off. Sometime prior to moving with your dog, have your dog's health reviewed by your vet and at the same time pick up a summary of his medical history. Also, check into the health and vaccination requirements of your new residence location if you're relocating to a different state. When it comes to your dog's records, everything from birth papers, to vet visits, to vaccinations and anything you just want to hang onto about his life, you can assemble it all in a simple 'pet record organizer'. With everything in one place, you'll always know where to find it for yourself, a pet sitter, or a new vet. One example of a record-keeper is The Complete Dog Organizer which can be found here. Time to pack up Rover's supplies, food and favorite toys - make a list so that you don't forget anything. Put them in a place that will be readily accessible during the trip. Water and/or ice cubes in a cooler are especially nice to have available at rest stops. It's best not to feed your dog too much during the driving time - he'll travel easier with just a couple of small meals. On the actual day of departure, the unusual activity is bound to cause your dog some stress and he'll want to stay in close contact with you. You might want to consider attaching his leash to a belt you are wearing so that he can be not only safely with you, but also be assured that he is not going to be left behind. On the other hand, you could take him to a neighbor before the moving activity gets underway and then pick him up when you're ready to leave. Once you arrive at your new home, unpack all your dog's necessities right away including his bed and favorite things. Let him see you set them out and then take him a tour of the home, both inside and out, giving him a chance to mark a new bathroom area. Most likely, you'll have to spend a few days going over the housebreaking routines just as you did at the beginning. He may have an accident or two, but be kind and patient. After all, he didn't choose to move and will need a period of adjustment. When you see that your dog is settling in, you can start taking him out to investigate the new neighborhood. The good news is that for the most part dogs are closely bonded to their families and handle transitions better than other pets.